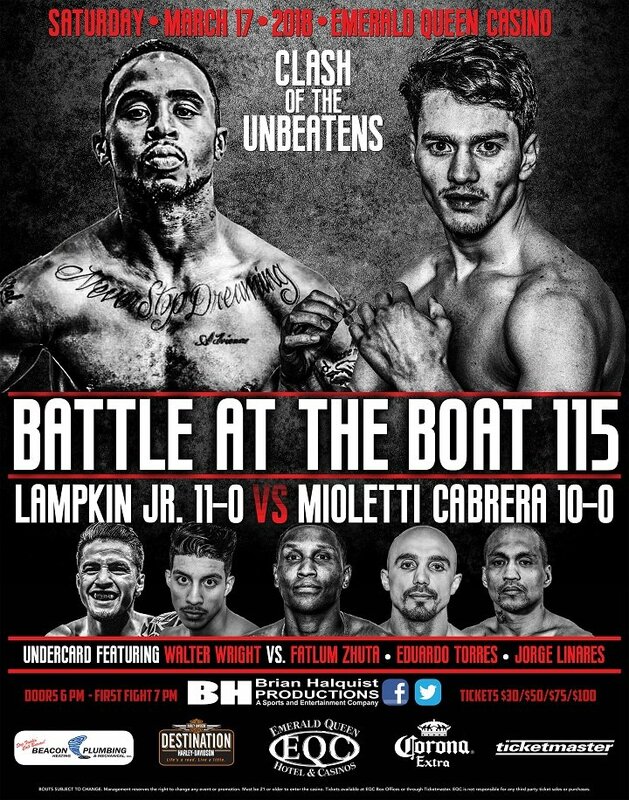 It will be a clash of the unbeatens in the main event of Battle at the Boat 115 when Giovanni Mioletti Cabrera and Ray Lampkin, Jr. face off against each other at the Emerald Queen Casino in Tacoma, Wash. on March 17. Fresh off the biggest win of his young career, Mioletti Cabrera will put his perfect 10-0 record on the line against Lampkin’s equally impressive 11-0 career mark in a 10-round super featherweight contest. The six-bout card will also feature three additional undefeated fighters on the undercard, including Fatlum Zhuta, who will face Walter Wright in a 6-round super middleweight featured bout. After besting previously undefeated Roberto Meza to close out last year, Mioletti Cabrera opened 2018 with his greatest triumph to date as he beat IBF’s former USBA lightweight champion Tyrone Harris (26-11, 16 KOs) on Jan. 13 via unanimous decision. Mioletti Cabrera, who fights out of Chicago, has fought four times in Tacoma. During his second career fight he handily defeated an 8-2 Jeremy McCleary. In addition to his win over Meza, who was 8-0 at the time of their fight, the 23-year-old Mioletti Cabrera has bested three undefeated boxers. He will look to make Lampkin No. 4. But that will certainly be easier said than done as Lampkin has yet to taste the sting of defeat himself. A native of Portland, Oregon, Lampkin is coming off perhaps the biggest win of his career as well after winning a unanimous decision over Joshua Davis, who brought a strong 11-1 record in to their Oct. 19, 2017 fight in Atlanta. Lampkin is the son of former NABF lightweight champion Ray Lampkin, Sr., who opened his career an impressive 19-0-1 over his first 20 bouts and once fought Roberto Duran for the WBA World Lightweight Title in 1975. Lampkin has fought three times at the Emerald Queen Casino, the last time coming in 2015 when he knocked Andres Reyes from the ranks of the undefeated with a majority decision win. Wright, who competed on ESPN’s The Contender Season 2, came off a five-year layoff to win his return bout on Jan.12, defeating Rafael Valencia by unanimous decision. Appearing as the overwhelming 60-54 victor on all three judge’s scorecards, Wright, a native of Seattle, improved his record to 15-4 with the win. Zhuta also fought on the Jan. 12 Battle at the Boat 114 undercard, and it was about as dominating a performance as any on the card as he knocked out Eddie Hunter a mere 40 seconds into their fight. Battle at the Boat 115 will feature the VIP experience with 3rd Row Seats being discounted to $75 per ticket. All fans seated in in the VIP section (rows 1-3) will have an exclusive access point and a dedicated server to help create a true VIP experience. Battle at the Boat 115 is brought to you by Brian Halquist Productions. For more information, please visit www.halquistproductions.com and the Battle at the Boat Facebook page.